The center part of the top is on hinges and flips open with grain running left-right; the left and right parts of the top are fixed with grain running vertically. The plan would be to make this all from solid maple with dovetails around the 4 corners where you have end grain meeting end grain – just like a big box, with a plywood bottom in a rabbet. Will also beef up the legs/base. Overall the table is 35” wide and 17” deep. My concern is wood movement on the fixed portions of the top vis-a-vis the front and back. Same problem as for a typical table top, but in this case the boundary between the fixed portion of the top and the sides is very visible because there is no overlap – any gap will look really bad. 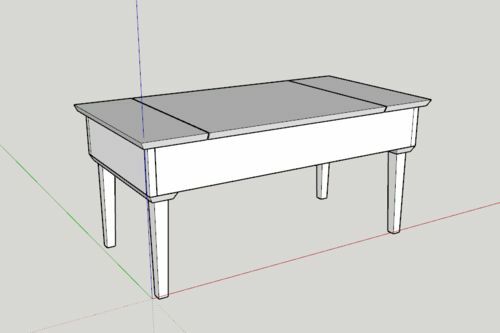 Do you think that typical table top fasteners will suffice, or not tighten the gap enough for appearances? How narrow would the fixed sides have to be that I wouldn’t have to worry about it and just glue them down? The end tops looks to be about 8” wide so I wouldn’t worry on much wood movement. If it does move to where you have trouble opening and closing the lids, then sand off the edge that rubs and only refinish the edge sanded. You could you Z-clips on the end table tops. and just readjust the ends to match gaps to the closed lid. Just my take, but even if it has divisions from the opening lid, I would orient all the wood running Left to Right as most people look at things. I think your turning the outer pieces of the top would be quite jarring to look at. I think if you just grab some pine, or even plywood to make a mock up, a showing to people would vote this way too. Too many variables to say a certain size of wood to glue down without worry. How it’s cut, species, and of course size, not to mention it’s environment. Those clips work just like they are designed. For that style many make their own from wood. The link that therealSteveN has is a nice link to 3 methods of fasteners. Too many variables to say a certain size of wood to glue down without worry. How it s cut, species, and of course size, not to mention it s environment. Those clips work just like they are designed. For that style many make their own from wood. I agree here ^. That design is going to throw off your eye. I would make the top inset. I don’t care for the look of everything sitting on top . A mock up with inexpensive wood is in order. I would never assume wood movement won’t be an issue for anything much wider than a few inches. I’d consider firmly attaching those top, end pieces firmly to the sides, since both have grain in the same direction. You could also firmly attach them to the long side, but only near the corner. Then I’d use the table fasteners at the point farthest from the corner. The fasteners that allow the top to move. As for a gap, that’s going to happen no matter what unless the humidity is constant and it is sized exactly. You could of course design for the intended location if you know what the humidity is and know it will be more or less constant. However, I don’t see a gap as a big deal. 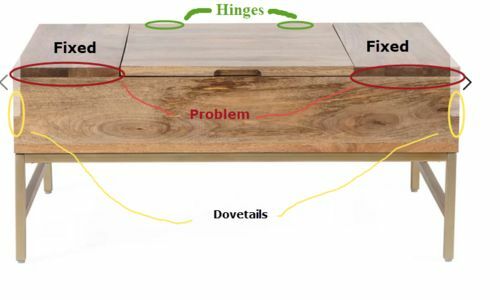 It’s wood not metal, so precision mating surfaces are not something you’ll get in this design. One thing you could do is use the floating table top fasteners all around and use that to adjust the gap. Then tighten down the ones nearest the gap. The gap should stay constant as the wood moves it will extend past the ends. Of course as shown, those ends do not have an overhang. You’d have to build some overhang in so that when the wood shrinks it won’t pull past the ends. I’m sorry to say I really dislike that design, others have given you solid tips on how to accommodate wood movement and if you follow that advice you will be fine. My thought is that every horizontal surface will collect stuff and in order to open that top you are going to have to move it out of the way or it will all slide off onto the floor. If it were mine I’d put drawers in it instead of the lift lid. You don’t mention what wood specie you are using, but if you could get your hands on quartersawn wood, it will be more stable than flat sawn. The wood WILL expand and contract, just not as much. I would orient the top boards to have continuous grain running the length and switch to drawers as suggested by Bondo. If this is the aesthetic your wife likes, then it doesn’t matter what we like. Given the design you show, I agree with WoodenDreams above, I wouldn’t expect much wood movement. Fasten the end pieces with Z-clips or something similar and then if there is some movement that causes problems, loosen the screws and adjust it. Agree do a mock up with grainy wood like oak, if wife likes it go ahead. Recommend some overhang, 1/2” maybe, and work in some appealing edge treatment that helps hide the seam under the top. Agree that a drawer makes more sense for the reasons stated but work that out with your “customer”. I just realized why I don’t like it. 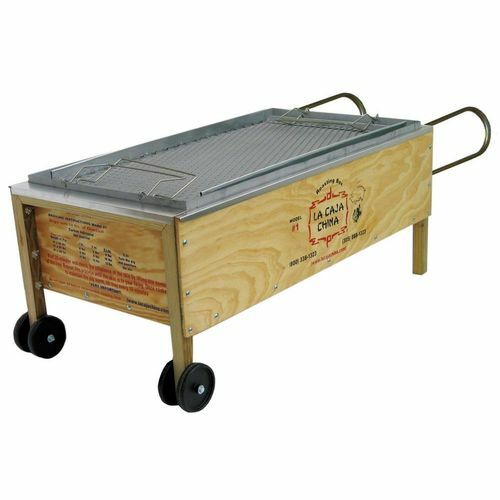 It reminds me of a coffin / street vendor roasting box. It needs alot of work in the design department. Just because it has dovetail jointery doesn’t make it special. Well its nice to see some unanimity on LJ – everyone hates the picture of the table, LOL. Its for sale here by the way, only $509. The change in grain direction on the top is actually how they sell that table, not sure why. Anyways, my wife wants storage for her knitting gear and a flip top, so I’ve been messing with this. I’ll keep the grain in one direction as everyone says, which means I think I can only glue the “fixed” sides down on the back edge and have to use fasteners elsewhere. I’ve added a lip so that any gaps between the sides and the top won’t be so apparent. Current design is something like this, made from flatsawn maple. I realize it more or less looks like an old fashioned schooldesk ….. but it is only 18” high. The reason for the dovetails on the sides is …... that I bought a dovetail jig recently and want to use it, LOL. If it turns out really ugly I’ll add wheels and she can use it to sell roast chestnuts, as suggested. Strong enough or more support needed? The legs are only about 10 1/2” long. 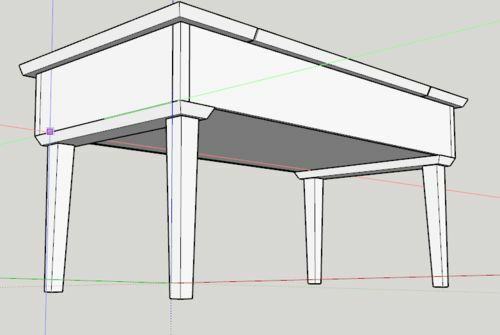 The selling point for that table is the top that raises into a desk/snack table, without that, no reason to hinge the top. The leg design seems fine but I have never built that style. I doubt that you would need 3/4 ply in the bottom – unless your wife plans to store her collection of flat-irons in it.